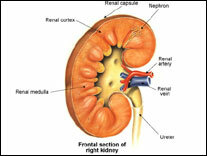 Medical renal diseases are those that involve principally the parenchyma of the kidneys. Hematuria, proteinuria, pyuria, oliguria, polyuria, pain, renal insufficiency with azotemia, acidosis, anemia, electrolyte abnormalities, and hypertension may occur in a wide variety of disorders affecting any portion of the parenchyma of the kidney, the blood vessels, or the excretory tract. 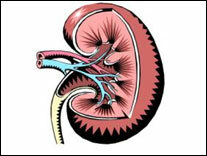 Because treatment and prognosis vary with the cause of nephrotic syndrome, renal biopsy is important. Light microscopy, electron microscopy, and immunofluorescence identification of immune mechanisms diagnose most causes of nephrosis.